New analysis of data from HUD's Family Options Study of adolescents’ experiences in shelter with their families and 20 months later shows that most adolescents continued to live with their families, and some continued to experience housing instability or live in overcrowded situations. 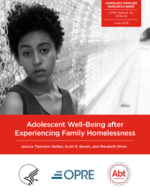 These adolescents were more likely to have changed schools or been absent from schools than their peers nationally, and school mobility was associated with persistent homelessness or doubling up. Young people who changed schools frequently had slightly lower grades, less motivation, and slightly more problem behaviors than those who did not. Twenty months after a shelter stay with their families, adolescents exhibited more problem behaviors generally than their peers nationally.